So, yesterday I gave you a brief introduction to Body Thrills, and I thought I would follow it up with a few short reviews of my favourite Body Thrills products. 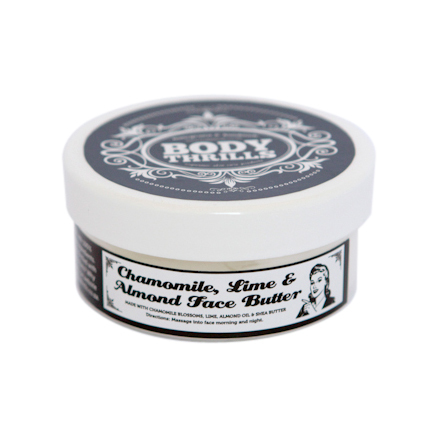 First up, is the Chamomile, Lime and Almond Face Butter. Hear me when I say, THIS MOISTURISER IS AMAZING. 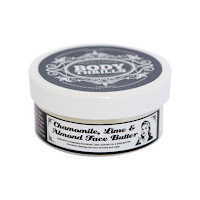 It smells delicious, absorbs instantly, lasts forever and is perfect for sensitive skin. Both the Rooster and I love this product, and yes, my man is a metrosexual, thank you for asking. My favourite thing about this moisturiser is the inclusion of almond oil. Almond oil is a lightweight oil, easily absorbed by your skin and, unlike synthetic moisturisers in most commercial face creams, it is more similar to the oils naturally produced by your skin. NOTE: If you're allergic to nuts, this is not for you, but don't worry, there are plently of other lovely products to choose from!